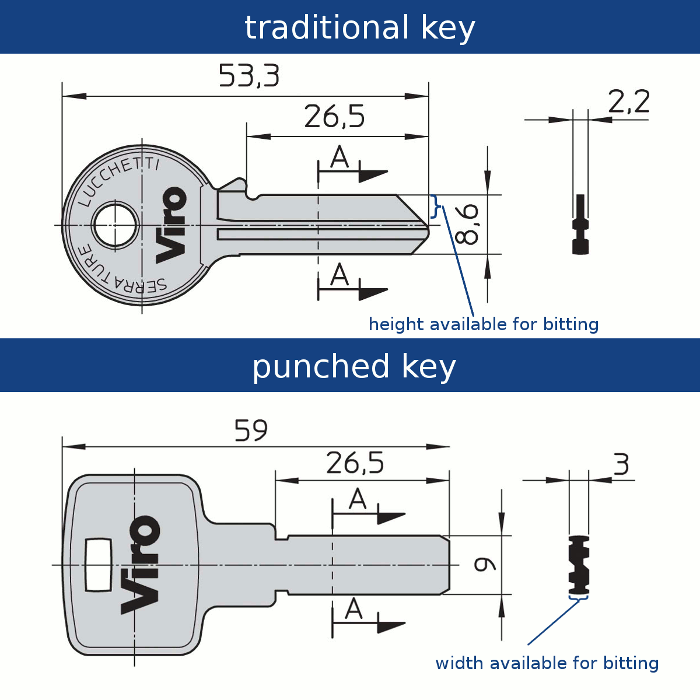 One often speaks of a “European key” to refer to the punched keys which are used on many security locks. In reality, not only is the name “European key” technically inaccurate but – above all – this type of key does not necessarily indicate a high security lock. Let’s look at it one step at a time. 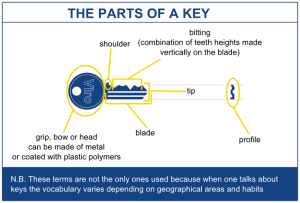 First of all, when one speaks of keys for cylinders, there is no such thing as a “European key”. If anything, in order to be “European”, it is the shape of the cylinder itself, or its profile, which is significant. Many high security European profile cylinders already adopted a key bitted in a different manner a few decades ago. It did not have teeth made vertically on the blade of the key, but punches (or cups) on the thickness of one or more side surfaces of the key blade. This has come to be known as a “flat” (because it is gripped with the head held horizontally) or “European” key, like the profile of the cylinder on which it was used. The correct name is ” punched key”. 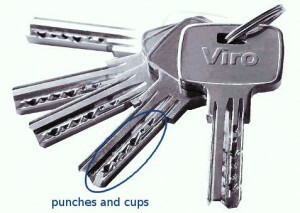 Punched keys are used in high security cylinders because they allow the use of more pins compared to traditional keys. For example, you can insert two rows of pins on the one side of the key and/or others on other sides. This increases the number of possible bittings. This increases the number of different keys which exist for that particular cylinder model and it becomes more difficult to open it by lock picking or key bumping. But the fact that a cylinder uses a punched key is not in itself an indication that it is a high security cylinder. Indeed, from this point of view, a punched key may also be counter productive and have a fewer number of bittings than that of a traditional key. The number of bittings theoretically available is given by the number of possible heights of each pin (which corresponds to the number of possible heights of the teeth or possible depths of the punches on the key) with respect to the number of pins present in the cylinder. It is true that by using a punched key one can insert a greater number of pins in the cylinder, thus increasing the security capacity, but generally one would have a smaller number of possible piston heights available and there would therefore be a smaller security base, annulling, at least in part, the increase in capacity. This is because the punches are usually made on one or more sides of the blade. In this case, the area which can be used is only a part of the thickness of the blade itself. On the other hand, in a traditional key, the available area to cut the teeth is much greater, since it corresponds to most of the vertical height of the blade. The cups of a punched key can therefore, for physical reasons, be less deep than the teeth of a traditional key. 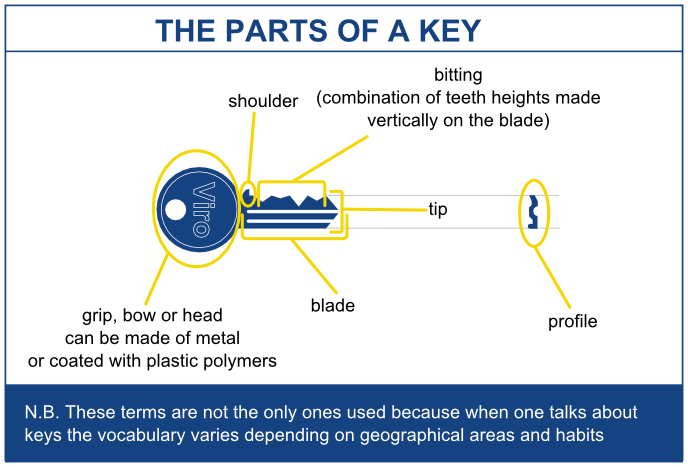 For example, one normally considers that the height of the blade of a traditional key is at least 8.5 mm and more than 3 mm can be cut to make teeth. 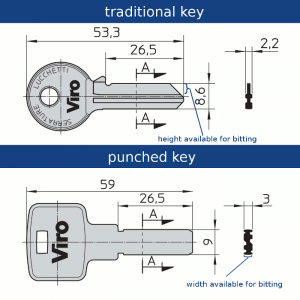 Generally, the thickness of the blade of a punched key does not exceed a total of 3 mm. So as not to puncture the key from one side to the other, the depth of the cups cannot exceed approx. 2.7 mm, if the bittings are only made on one side, and approx. 2.25 mm, if they are made on both sides. Basically, therefore, the pins must use a fewer number of heights,especially if the precision of machining is not excellent. This problem affects to a greater extent the reversible punched keys, that is, those which can be inserted in both ways. In fact, even though the bitting will be mirrored (so looking, for example, from above the key, the punches will be offset on the upper side to the left and on the lower side to the right) it will be necessary to discard certain combinations in which the order of succession of the depths of the cups could create interferences. Normal cylinders for internal doors generally have 4 or 5 pins. Since one can count on a smaller number of usable pin heights, a cylinder with a reversible punched key can be broadly considered to have an acceptable level of security only if it adopts a greater number of pins, more than 6. On the other hand, punched keys, especially if they are reversible, which only have 5 pins (and, therefore, 5 punches per side) can give rise to legitimate concerns regarding the level of security of the cylinder which they use. Also, bitting keys in a reversible mannercreates profiles where both sides are mirrored with each other, thereby affecting the possible forms that can be obtained on the same profile. On the contrary, with a non-reversible key, there is practically no limit to the complexity of the profile shape which can be achieved. This is important because, the more the profile is complex, the greater will be the difficulty in opening using the lock picking technique. As always, therefore, when security is at stake, one must not merely trust the appearance, but it is necessary to make in-depth enquiries and consult serious and competent companies and professionals. This entry was posted in Locks and Cylinders and tagged technology on 2 July 2014 by Mara Rossi.